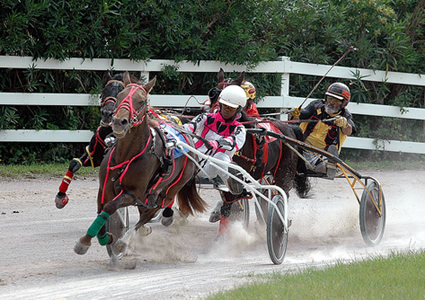 Mohawk Raceway takes center stage in the standardbred world this weekend as Saturday, June 11 a swarm of eliminations present some of the season’s hot horses from various divisions. 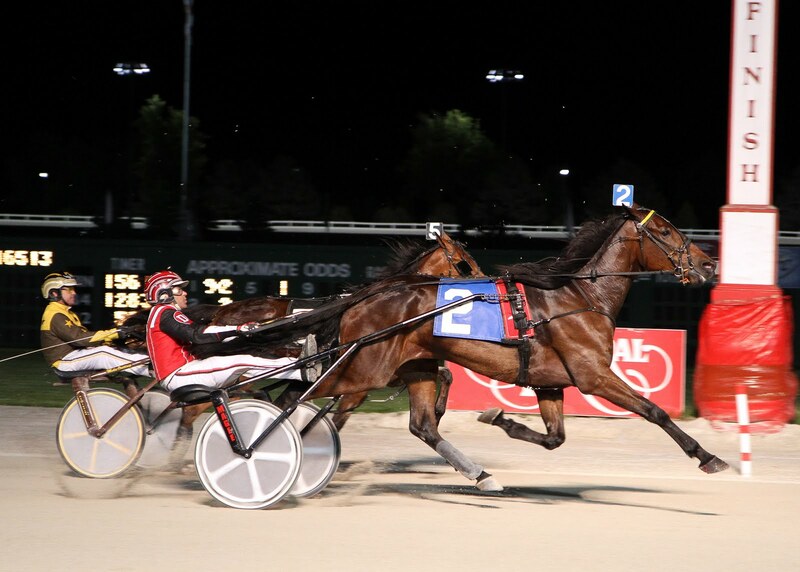 Battling for berths in the $1-million North America Cup, three splits of 2011’s top soph-colt pacers are featured, along with elims for fillies in the Fan Hanover Final and glamour-boy trotters’ elims for the Goodtimes Final. The latter will be part of the Hambletonian Trail blog, as will a pack of races for eligibles in the continuing saga of sterling square-steppers, all reviewed afterwards at the Hambletonian Society website. This is a talented group of glamour-boy pacers, proven by the Somebeachsomewhere divisions last week that prepped most of them. Those three splits, all won by outsiders, were not flukes; this crop is already showing deep star power. In the first elimination “Cup,” Big Jim will be the likely favorite in his group. Since he was defeated last time, he may continue to be vulnerable to other striking pacers. Which is why Powerful Mist looks plenty the best here. He came first over at three-quarters in the “Somebeach” where “Jim” was defeated. That three-quarters went in 1:21.3, quarter in :27.1. He went a little too fast in that event. Seeing that, driver Tim Tetrick may change his strategy when he drives “Mist” against Jim again. Just how good is Custard The Dragon? It would be no surprise to see him getting into the final (top three in each split and fastest of the fourths make the 10-horse final field). The second elim is the toughest of the trio because you have Feel Like A Fool in here, along with Betterthanchedder, Up The Credit, Grams Legacy, Eighteen, Lookinforadventure, Townslight Hanover and Shadyshark Hanover. This field may be very aggressive; someone may set a track record. But if there were one to watch, it would have to be Lookinforadventure. He is still an improving horse and may show his best to get into the Cup. Also expect a big move from Up The Credit. In the last elim, Roll With Joe looks as if he will be the favorite for beating Betterthanchedder last week. But there is still no clear favorite. Since it is like that, you got to go with Big Bad John. He is an improving colt. Also watch Wink N Atcha. Check out the Facebook Twinspires page for our projected final Cup field. Saturday, at Mohawk, the glamour-girl filly pacers, led by the star of stars, See You At Peelers. Just off the Yonkers win against some mediocre soph pacers, “Peelers” has little to combat in the first Fan Hanover elimination of the program. If you want to key Peelers, on top of exotics, then Honky Tonk Woman is the choice. She is an improving horse. If you are brave enough, you would put her on top. In the second elim, it looks like Krispy Apple will be the favorite and although hard to beat, Rocklamation looks like she is improving at three. We cashed in well with her at two and support her as a possible upset. In the third split, Cammile is the likely favorite and certainly one to beat. This field is just not that good, which is why Cammile will be the huge choice. What’s New Pussycat is showing signs of life for an exotic or upset if you get brave, else it is a pass. The $150,000 Maxie Lee Memorial at Chester on June 12 pits some of the top free-for-all trotters we have been seeing sparing all year. In the field of Anders Bluestone has the most money and wins accumulated this season, matched only in wins by Neighsay Hanover. Still, the return to form for Corleone Kosmos this year has made him look like he can put together a bundle more money for his trainer Ross Croghan. This is an odd bunch considering the connections. TrondSmedshammer has Calchips Brute but his former student, “Neighsay” is handled by Ray Schnittker. Trond still has Likeabatoutahell—in here too. Pilgrims Chuckie, from last season’s Hambo Trail, is back at four with a new trainer, Tom Cancilliere. And Ron Burke handles the only mare here, Buck I St Pat. A tough field, for sure, hopefully making “Kosmos” a good price for a good trip. The June 11 no-takeout Pick 4 at Cal Expo is from Race 9 through Race 12. (1) Town Of Lodi didn’t fire for us last week after a hot race the week before. Let’s use ‘em again, since what he brought to the table was not embarrassing at 32-1. (6) Jeano needed her last race after a rest from losing as a choice. Either of these could light up the board here. (3) Incredible Gambler was well supported at 4-1 and could have won it if he didn’t have to traverse the outside most of the way. This is a poor field so I don’t mind singling him . (5) Jessililpeace won and won big. She has been good this year in streaks and may be on another one. However, we cannot ignore (6) Sayitoutloud, who, at 31-1, shot to the lead only to be hung and worn out by the stretch. (3) El Grande Real had dangerous early foot last out and seems to want to get the lead and hold on strongly. As it was, he ended up fourth after a strenuous mile. (5) Bo Knows Power should have won, so give him another shot if it means a short price, anyway; it won’t matter if we strike with the others. If you want to use all of these, the 16/3/56/35 ticket cost $8 ($1 ticket).